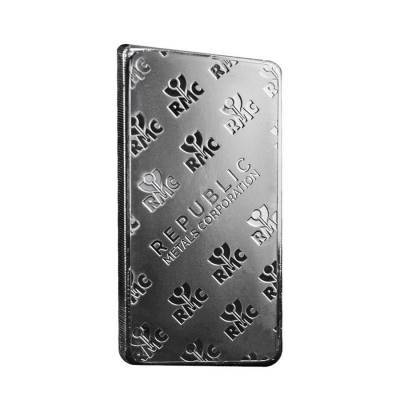 This exceptional Republic Metals bar is made from .999 fine silver and considered one of the highest-quality silver bars on the bullion market. Republic Metals is a highly reputable refinery well-known for using the latest manufacturing techniques and implementation of “green refining technology”. Republic Metals Corporation is ISO 14001 Certified, the first U.S. metal refinery awarded with such designation. In addition, the U.S. Department of Energy has rewarded Republic Metals Corporation for its commitment to environmental protection. This 10 oz bar is minted with a frosted background and polished foreground. 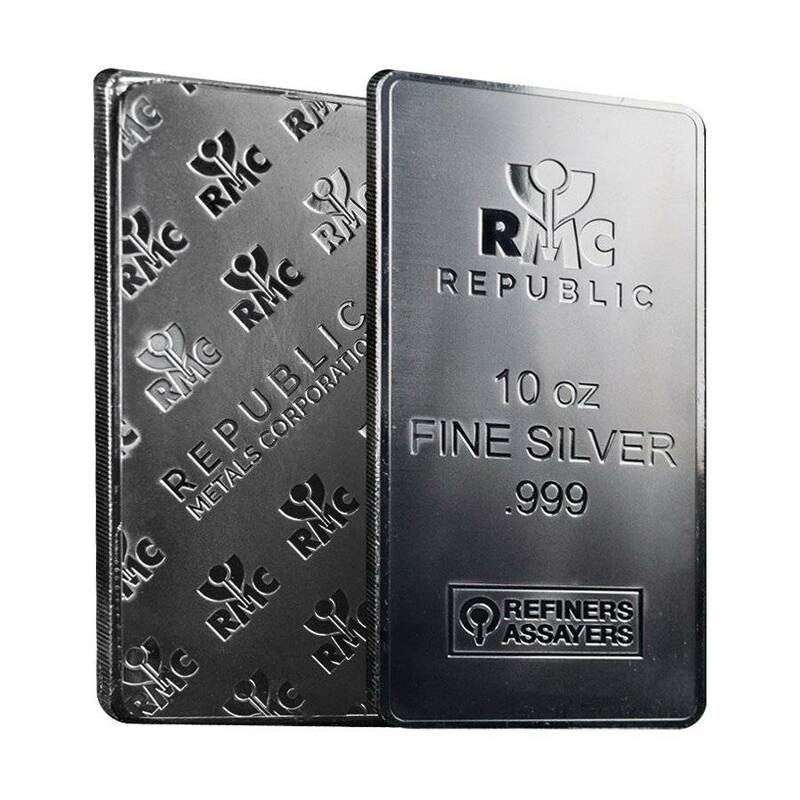 On the obverse side, the bar is marked with Republic's minimalist logo design and the words "10 oz", "Fine Silver .999" and "Refiners Assayers" beneath it. 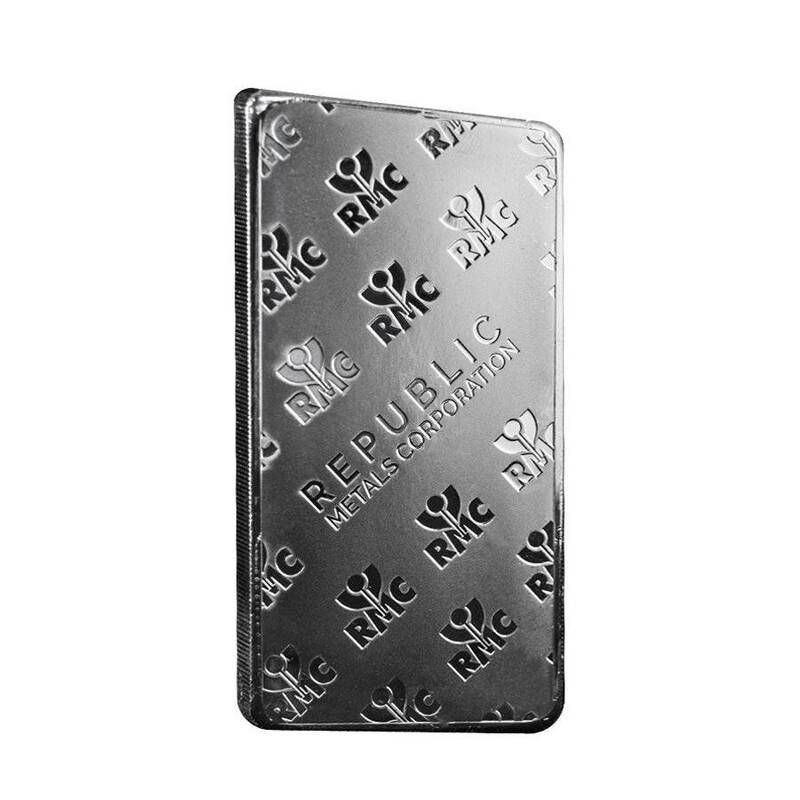 On the reverse side, a diagonally repeating logo design surrounds the words "Republic Metals Corporation." This bar will be a great addition to any precious metals portfolio. Made from .999 fine silver, with a weight of 10 troy oz. Individual bars come sealed in plastic. Lots of 25 come packaged in a box, while lots of 50 come in monster boxes. Obverse: Features Republic's minimalist logo design. Inscriptions: “10 oz”, “Fine Silver .999”, “Refiners Assayers”. Reverse: Depicts diagonally repeating logo design. Inscriptions: “Republic Metals Corporation”. Bullion Exchanges offers you a great selection of exclusive items from renowned international refineries. Order this amazing bar today, and it will be carefully wrapped, packaged, and delivered to your address. If you have any questions, just call us at 800.852.6884, or send us a message, our customer service representatives will be happy to assist you. great customer service i have no complaints! They take care of you lovley!! Got my package in and i'm very pleased! A vert beautiful bar! A fine place to buy bullion from! !